On this sunny September morning, we were pleased to welcome Terry Morse, of Terry Morse Software and Greg Rewis of GoLive Systems, Inc. It is great to have software vendors make the long trip from the left coast to visit us and we really appreciate it. This turned out to be Web Month, as you will see. The meeting opened with the usual question and answer session, ably hosted by Pi Secretary and Macintosh guru Lawrence Charters. The questions were as usual quite varied and the answers enlightening. Following announcements, including the debut of Pi Fillings, the CD, version 4 and the forthcoming Pi Fillings Goes to School, we were off and running with two excellent presenters. First up this Saturday was Terry Morse of Terry Morse Software demonstrating Myrmidon. According to Webster, a Myrmidon is "1. A member of a legendary people of Thessaly, devoted followers of Achilles in the Trojan War. 2. A person who executes without question or scruple a master's commands." I think maybe Terry had the second definition in mind when he created Myrmidon. Myrmidon is a chooser extension which intercepts program output and creates HTML documents with remarkable fidelity to the original. As anyone knows who has used the "Save as HTML" options from Microsoft Word, AppleWorks (nee ClarisWorks) or others, your original formatting pretty much disappears and the graphics end up scattered willy-nilly over the page. Myrmidon solves most of these problems and does a remarkable job in retaining the formatting of the original document. Terry used Word, Quark and several other programs, using their "native" HTML export commands and "print to Myrmidon". Calling the results up in a browser clearly demonstrated the power of Myrmidon. In most cases, the output was almost identical to the original document. While Terry admitted that there were some programs, notably Adobe Acrobat, which gave Myrmidon fits, most of them should work admirably. More information and ordering details can be found at http://www.terrymorse.com/. The program has several options for controlling how the output is converted including an option to use a CyberStudio grid, more on which later. The program is incredibly easy to use, simply select Myrmidon in the chooser and print. What could be easier? As a special treat for those attending the meeting, a special price for meeting attendees was offered. Just shows that it pays to attend the monthly meeting. Hint. Hint. Next up was Greg Rewis of GoLive Systems, Inc. demonstrating GoLive CyberStudio 3. He brought along lots of 30-day free trial versions to give away to meeting attendees. We gave them all away. He also brought along two copies of CyberStudio 3, Personal Edition to give away. Greg was without doubt one of the most enthusiastic and entertaining presenters we've had in a long time. He quickly pointed out that CyberStudio 3 was a great product for taking the output of Myrmidon and turning it into a professionally designed web site with all the bells and whistles of modern web site design. As usual, our meeting closed with a door prize drawing. Patrick Garvey won the copy of Myrmidon and Sandy Rogers and Harald Hoiland won the copies of CyberStudio 3 Personal Edition. Apple T-shirts went to Bob Vandergrift, Harriet Vandergrift, R. Birdsong and Arthur Hoiland. The book Sad Macs, Bombs, etc was won by Sallie Engel. Bob Hewitt took home a System 7.5.5. reference manual. 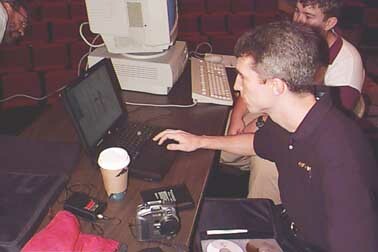 E. L. Durham, Jr. walked away with a Mac 3D Handbook and CD and Jack McCalman took off with PageMaker 6 for the Mac (book). Last but not least, Charlie Cook took home the coveted GTSI Mouse Pad. That's all for this month. Next month, Apple Computer has promised to come and give us a demo of MacOS 8.5. Also appearing will be Symantec, who recently released their latest version of Norton Utilities. Coming in November, MovieWorks, CorelDraw 8 and the Washington Apple Pi 20th Anniversary Celebration! The final garage sale of 1998 will be held in the gymnasium across the hall on December 12th. Special thanks to Terry Morse and Greg Rewis for coming to visit us. We hope to see them again soon. Thanks also to Bill Wydro, Beth Medlin, my son David and to the support staff of NVCC for all of their support. See you next month!